Prior to last year, the Bay 101 Shooting Star Main Event was a staple of the World Poker Tour schedule. After a one-year hiatus, the Shooting Star returned to the poker calendar this week, just without the WPT TV cameras in tow. That didn’t prevent the final table from being a star-studded affair, though. 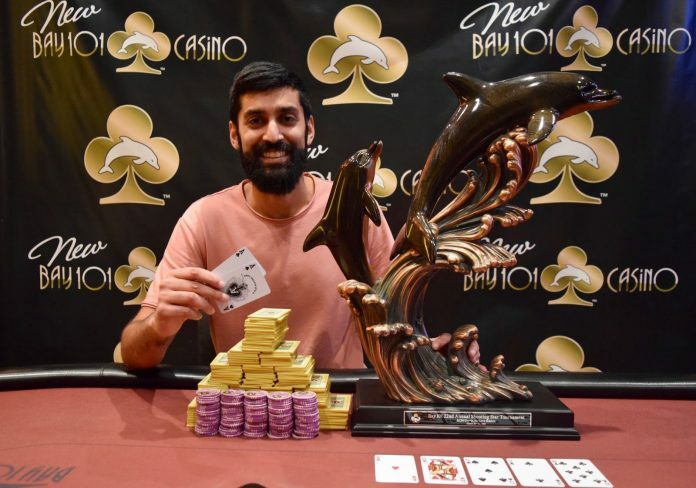 Sandeep Pulusani beat out a final table that included two-time World Series of Poker bracelet winner Loni Harwood, WPT Five Diamond winner Ryan Tosoc and Super High Roller regular Dan Shak to win $354,400 and the third live title of his career. Only five players remained at the start of the final day of play Friday, with Harwood on top with 34.4% of the chips in play. Early action wasn’t kind to Harwood as she lost 25% of her chips to Tosoc and then doubled up Pulusani. She got a chunk of those chips back through John Andress before the Pennsylvania-based poker pro met his demise. Andress was down to 80,000 in the big blind. With the tournament using the Big Blind Ante format, Andress was all in for 80,000 before seeing a card. Shak called the 40,000 from the button and Tosoc completed from the small blind. The flop came and Tosoc checked. Shak bet 50,000, forcing Tosoc to fold, and tabled . Andress turned over . The turn was the to officially end Andress’ run in fifth place. The river was the . Harwood managed to hang around another 90 minutes before losing a flip in heartbreaking fashion. Tosoc raised to 125,000 from the button before Harwood moved all in for just over 1,000,000 from the big blind. Tosoc called and turned over while Harwood showed . The flop kept Tosoc ahead. The turn, however, gave Harwood top pair but the river filled Tosoc’s straight and eliminated Harwood in fourth place. It took nearly an hour for the next elimination to occur. Shak raised to 150,000 from the button, Tosoc called from the small blind and Pulusani folded his big. Tosoc checked after the flop came and Shak continued for 200,000. Tosoc raised to 725,000 and then called when Shak moved all in for 3,760,000. Tosoc tabled for top two pair while Shak showd for top pair with a flush draw. Neither the turn or river were of any help for Shak and he was out in third place. Tosoc started heads up play with a 2.5-1 chip lead over Pulusani and it took just over 15 minutes for the final two players to agree to a deal. Pulusani was guaranteed $304,300 and Tosoc locked up $336,500 with an additional $50,100 for the eventual champion. It took another two hours before Pulusani finished off his comeback. Tosoc raised to 300,000 from the button, Pulusani re-raised to 900,000 and Tosoc announced he was all in and Pulusani called. Tosoc showed while Pulusani was well ahead with . The board ran out  to give Pulusani top set and eliminate Tosoc. The $354,400 score for Pulusani is the second six-figure score of his career and his first since he won a $3,000 NLHE event at the 2013 WSOP for $592,684. Despite not being a part of the WPT, the Shooting Star still drew 440 players for a total prize pool of $2,156,000.